If you would like to have a memorial bench placed in a park or open space in memory of a loved one you can purchase an engraved bench or bench with a plaque and donate it to Richmond Council who will maintain it as a public bench. 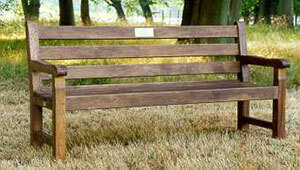 You can contact us to make an enquiry about donating a memorial bench. It will assist our enquiry if you have a location in mind as we will be able to look into the availability of that site. Currently our preference is to replace non-dedicated benches with new memorial ones, although we will consider requests for new locations in all sites, if appropriate. There are restrictions on the style and the placement of a memorial bench, with some sites already having a high concentration of seating. It may not be possible to have your preferred location; but we will consider all requests and try to find a suitable site. Some locations may also require approval from third parties. We currently offer two types of hardwood for benches - oak and iroko - along with the choice of a stainless steel plaque, cast bronze plaque or engraving for the inscription. The iroko bench can be delivered as planed and sanded or it can be treated in the same dark stain as the pictured oak bench. 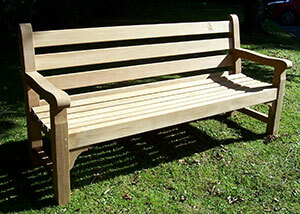 Depending on the choice of wood and inscription a memorial bench can cost between £800 and £1,400. Once location and wording has been finalised, our supplier will provide a proof and quote for approval. Each bench is made to order and construction will only start when payment has been confirmed by our supplier. We will issue you with an order number and details of how to pay once the order has been confirmed. Delivery is included within the quote and we will pay for the installation once the bench has been delivered. Delivery is estimated at six to eight weeks from receipt of payment. In the event that your donated bench falls into disrepair, is damaged or is unsafe for public use then we will need to remove it from the park or open space. We will endeavour to contact the family members on our database to inform them of the situation and seek clarification as to whether the family intend to donate a replacement bench. If the family decline or if we have no response then we reserve the right to offer the space to another family. We will afford the family a period of four to six weeks to make a decision regarding a replacement. We will keep a database of contact details for each family, however if these are to change for example due to moving address, please contact us to update your details.